Ageless Roger Federer said Sunday he was in a confident mood and warned his rivals he was "playing good tennis" as he aims for a third successive Australian Open title. 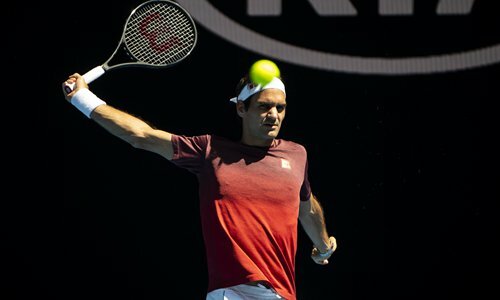 The Swiss master enjoyed a successful Hopman Cup warm-up in Perth and knows that at even the grand old age of 37 he has a great chance of a record ­seventh Melbourne crown and 21st ­major victory. "I'm playing good tennis. I'm confident that I think it needs a good performance by my opponent probably to beat me," said the third seed, who opens his defense against Uzbekistan's Denis ­Istomin in Monday's night match on Rod Laver Arena. A buoyant Federer revealed he had enjoyed a successful break coming into the 2019 season. "Throughout my career, I've been very lucky that in the off-seasons I never had any setbacks," he told reporters at Melbourne Park. "What I can say is the off-season was great for me. I think maybe it showed a little bit at the Hopman Cup already. Again, look, I'm playing tomorrow. We'll see how it's going to be here in Melbourne." Federer's first-round opponent Istomin caused a massive upset in Melbourne two years ago when he knocked out defending champion Novak Djokovic in the second round, outlasting the Serb over five sets. "I think the focus really is on those early rounds, especially tomorrow," said Federer, whose victory against Marin Cilic in last year's final was his 20th Grand Slam title. "I've had some tough ones against him in the past. He can play well in fast courts, and that's what it's going to be a little bit here as well," added the world No.3, who has won all six previous ­encounters against Istomin. "Depending on how you match up with your opponent, who is going to win the big points, the margins are so slim nowadays that I'm just not thinking too far ahead. "I don't think I should because I think that would be a mistake. I hope I can put myself in contention as the tournament goes deeper, but we'll see." Federer has skipped the European clay-court season in recent years as he tries to manage his workload to extend a remarkable career, which shows no signs of slowing. He said he hadn't made a decision on whether to play on clay this year and wasn't sure why he had not suffered ­major injuries like Rafael Nadal, Djokovic and Andy Murray, who will retire this year with chronic hip pain despite being six years younger than Federer. "I think you also need a little bit of luck. Maybe also the way I play tennis, maybe it's smoother than the other guys," said Federer, renowned for his flowing movement around the court. "It just maybe looks that way. I work extremely hard in the matches as well. It just maybe doesn't come across so much."